20-year-old resident of Arab city killed as locals clash with police trying to arrest resident. A 20-year-old man was killed in violent clashes that broke out on Monday night between police officers and residents of the Arab city of Kafr Qassem, located about 20 kilometers (12 miles) east of Tel Aviv. Police said the clashes began when officers attempted to arrest a resident of the city who was wanted for questioning. The man resisted arrest and attacked the officers, along with some 50 other people. The officers were able to apprehend the suspects, while the rioters threw rocks at them and set several police cars on fire. During this time, police said, a civilian security guard who was at the scene opened fire towards the rioters after he felt threatened, killing the 20-year-old. The victim, who was named as 20-year-old Ahmed Taha, was evacuated to the Beilinson Hospital in Petah Tikva in critical condition, where he was pronounced dead. 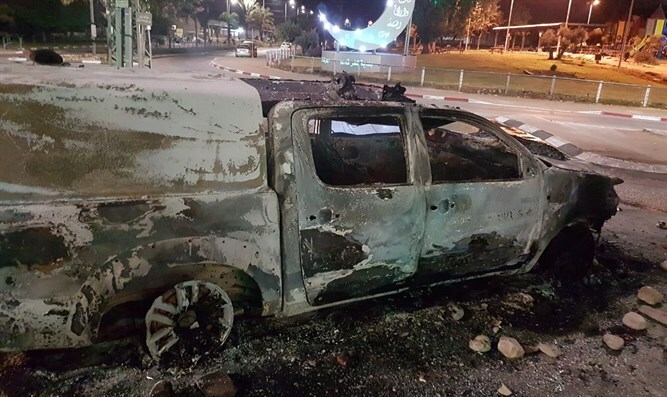 Police Commissioner Roni Alsheikh arrived at the scene, as did several Arab Joint List MKs, including Ahmed Tibi and Ayman Odeh, who criticized the police. "The police add insult to injury. Not only are they abandoning our security, the streets of our communities, and do not decipher murder cases, but they themselves attack and harms civilians," he charged. "The police continue to treat the Arab population as enemies who must be protected against and not as civilians to be protected. I am now in Kafr Qassem with citizens who are no longer willing to accept this twisted reality. Police must allow residents to protest as they wish, without the police themselves endangering them and their security,” he added.